The sophisticated look and natural cooling of a mesh-back chair, with a visual design that coordinates with other Volt models. Volt seating offers a unique combination of style, scale, comfort and functionality. Its real value is in its flexibility, with the ability to work in virtually any environment. 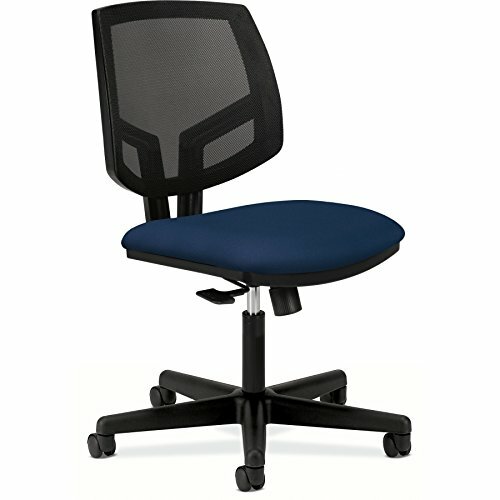 This mesh back chair with center-tilt has a generous seat cushion and a cooling mesh back for ventilation while performing active office work. Height-adjustable arms can be ordered separately for extra upper body support. To look sharp, stay comfy and pay less, look to Volt. Volt seating from HON offers upscale style, full-scale comfort and impressive quality at a surprisingly affordable price. 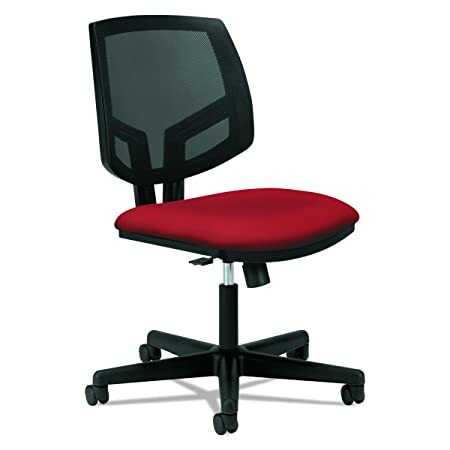 This mesh back chair with synchro-tilt has a generous seat cushion and a cooling mesh back for ventilation while performing active office work. Height-adjustable arms can be ordered separately for additional upper body support. The plush fabric seat keeps you comfortable all day long while the mesh back keeps you cool. The visual design has a geometric flair that belies its affordable price. The easy-to-use adjustments put personalized comfort within reach. To look sharp, stay comfy and pay less, look to Volt. Volt seating from HON offers upscale style, full-scale comfort and impressive quality at a surprisingly affordable price. 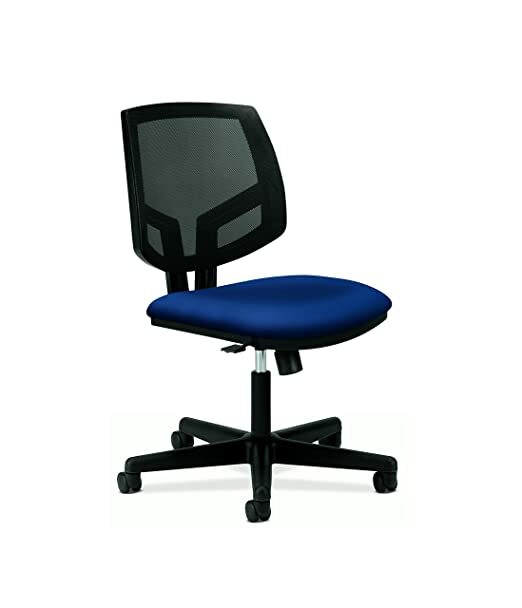 This mesh back chair with synchro-tilt has a generous seat cushion and a cooling mesh back for ventilation while performing active office work. Height-adjustable arms can be ordered separately for additional upper body support. The plush SofThread leather seat keeps you comfortable all day long while the mesh back keeps you cool. The visual design has a geometric flair that belies its affordable price. The easy-to-use adjustments put personalized comfort within reach. To look sharp, stay comfy and pay less, look to Volt. Volt seating from HON offers upscale style, full-scale comfort and impressive quality at a surprisingly affordable price. This low-back chair with center-tilt has generous seat and back cushions that are contoured for comfort while performing active office work. Height-adjustable arms can be ordered separately. Seat and back SofThread leather color is Black. The easy-to-use adjustments put personalized comfort within reach. To look sharp, stay comfy and pay less, look to Volt. Armless stool with five-star base and casters. Stain-resistant upholstery. Warranty: Lifetime. Made from polyester and fabric. Assembly required. 27 in. W x 26.6 in. D x 14.4 in. H (36 lbs.). Volt seating offers a unique combination of style, scale, comfort and functionality. Its real value is in its flexibility, with the ability to work in virtually any environment. 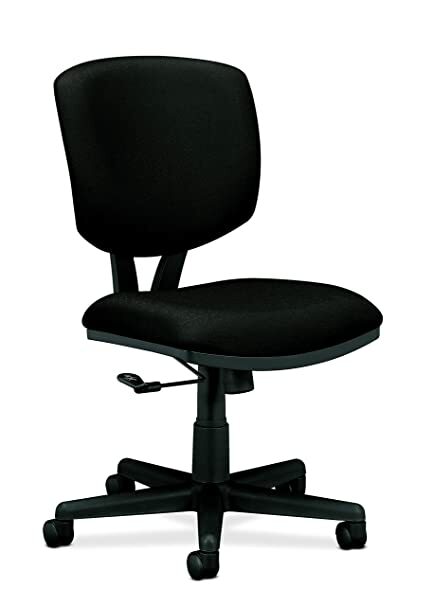 The larger seat and back provide maximum comfort, and the 360-degree swivel mechanism with tilt, tilt-lock and tilt tension options allow users to adapt the chair to their personal needs. The Synchro Motion option available on Volt seating allows the chair to effortlessly recline with the body’s natural movements, resulting in a more comfortable reclining position with better support. Volt seating from HON offers upscale style, full-scale comfort and impressive quality at a surprisingly affordable price. 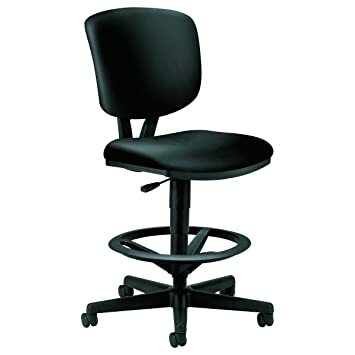 This task stool has generous seat and back cushions that are contoured for comfort. 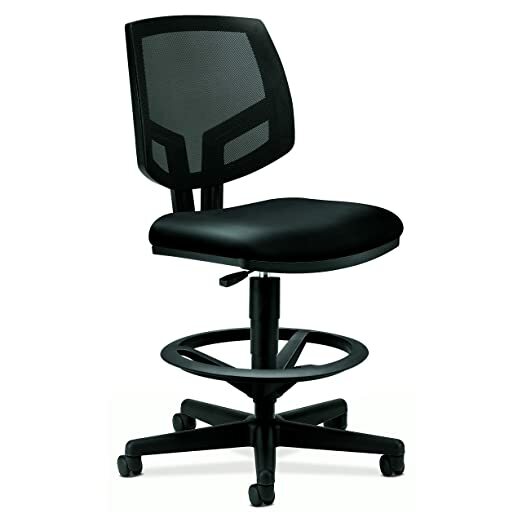 It is ideal for sit-to-stand applications. Height-adjustable arms can be ordered separately. Seat and back SofThread leather color is Black. The visual design has a geometric flair that belies its affordable price. The easy-to-use adjustments put personalized comfort within reach. To look sharp, stay comfy and pay less, look to Volt.Adjustable footring moves up and down. Volt seating from HON offers upscale style, full-scale comfort and impressive quality at a surprisingly affordable price. This mesh back task stool has a generous seat cushion and cooling mesh back for active support. 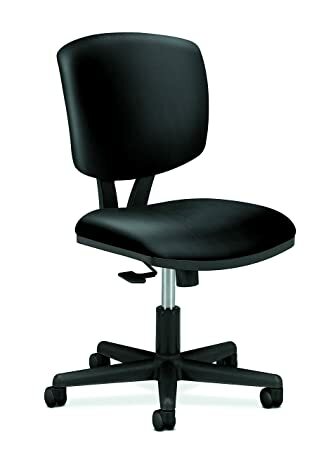 It is ideal for sit-to-stand applications. Height-adjustable arms can be ordered separately. Color is black.